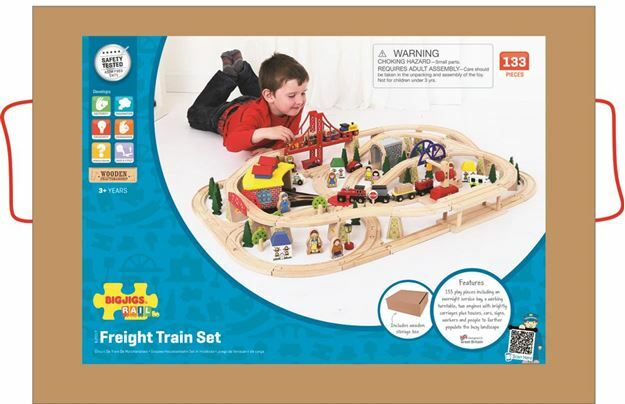 This extensive wooden Freight Train Set from Bigjigs Rail consists of 130 play pieces to keep young minds occupied for hours! Houses, cars, scenery, signs, workers and town folk help populate the busy landscape. For easy storage, track and accessories can be stowed away in the handy wooden storage box. Includes: 2 engines (one pulling fruit and vegetable wagons and the other pulling industrial wagons). a working turntable, triple engine shed, magnetic crane, grey stone tunnel and much more. Age 3+ years. Compatible with most other wooden railway brands. Distributed in New Zealand by Holdson.